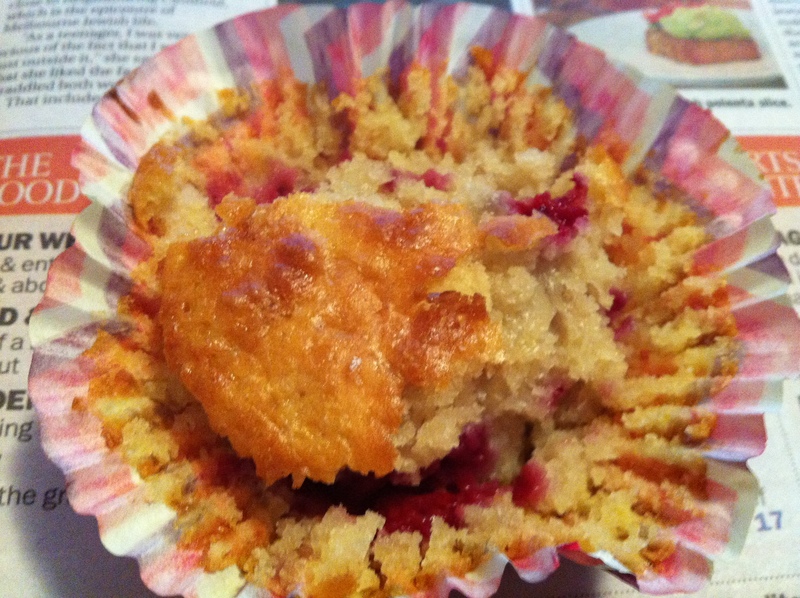 So my self-challenge to cook all the recipes from Nigella Lawson’s How to Be a Domestic Goddess continues with two muffin recipes: Lemon-Raspberry Muffins and Blueberry Muffins. 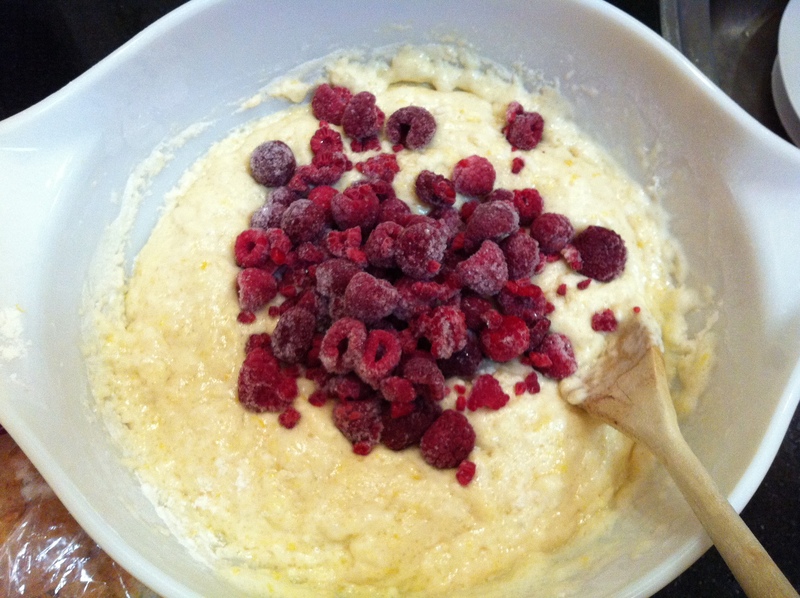 I cooked the lemon-raspberry muffins first, as I had a pressing need to get rid of the absurd amount of frozen berries I had filled up our tiny freezer with (what? They were on special at the supermarket!). We could no longer fit a loaf of bread in the freezer, and thus our bread was going stale. In the spirit of Marie Antoinette, I cried “let us eat cake!” and Nigella’s recipe was the result. Lemon and raspberry is a great combination, as I discovered when making cheesecake. Two things I learnt from this recipe: one – I did not have any baking powder (just soda), so I substituted Nigella’s plain flour and baking powder combo with an equal weight of self-raising flour. This worked fine. Well, it’s the same thing in essence, isn’t it? I don’t know why she includes baking soda AS WELL but I guess she is going for lightness… and I included it. Buoyed by this success, the other night I wanted to use up some of the citrus-as-art display I’ve got going on. Mr Behemoth likes to remark sourly (see what I did there with the sour and the citrus jokes? Oh don’t mind me, I’m just taking the pith…) that it is citrus-as-decaying-art if I don’t eventually do something about the 20 oranges and 10 lemons gradually mouldering in the bowl. Looking for a recipe that used oranges, I stumbled across the blueberry muffins recipe in which Nigella suggests adding orange zest. 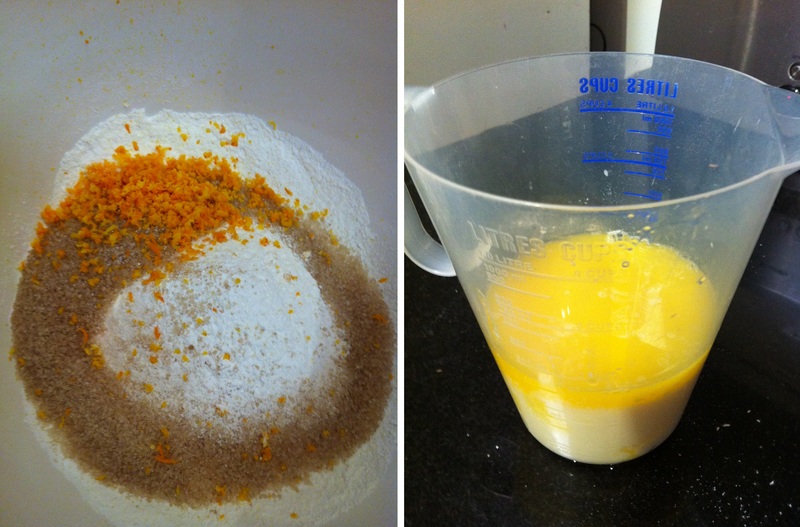 I squeezed the orange as well and used the juice to replace some of the milk in the recipe. 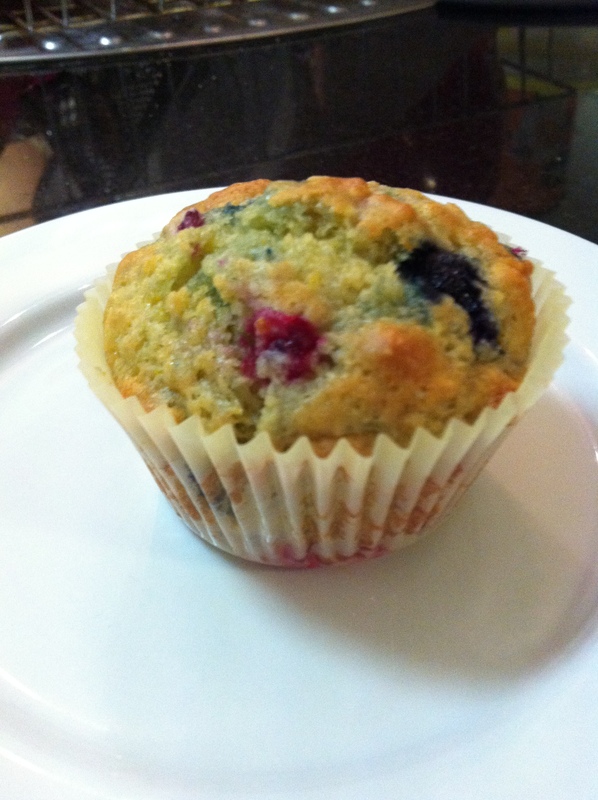 This muffin recipe uses either buttermilk – which I didn’t have – or plain yoghurt mixed with milk. I used Greek yoghurt (it’s what I had) and a bit of the aforementioned OJ as well as milk to make up my liquid component, along with an egg and melted butter. I don’t know if it is because of the yoghurt in this recipe, but the muffins stayed moist and delicious past the initial day of baking. They were tangy – probably due to the Greek yoghurt and the increased component of juice – but just sweet enough with the relatively moderate 1/4 cup of sugar. 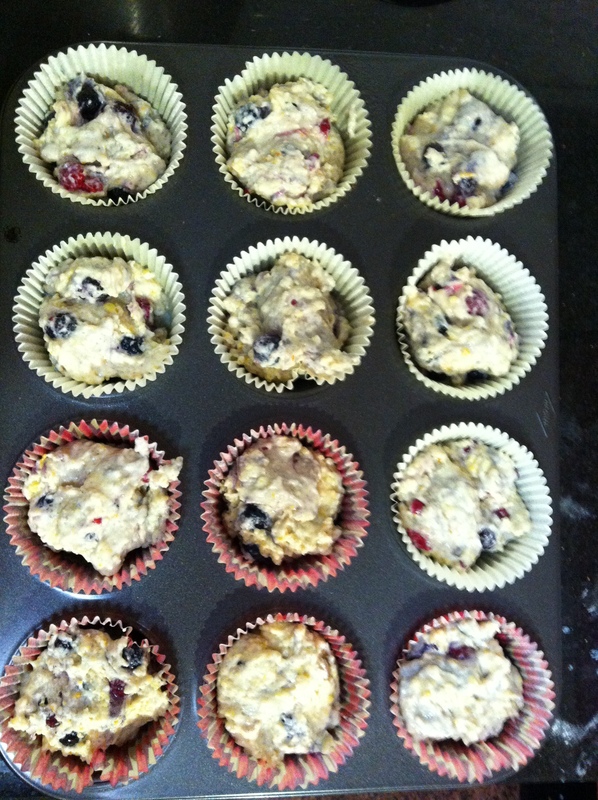 I also used mixed berries instead of blueberries, because, well, that’s what I had – my answer to everything. 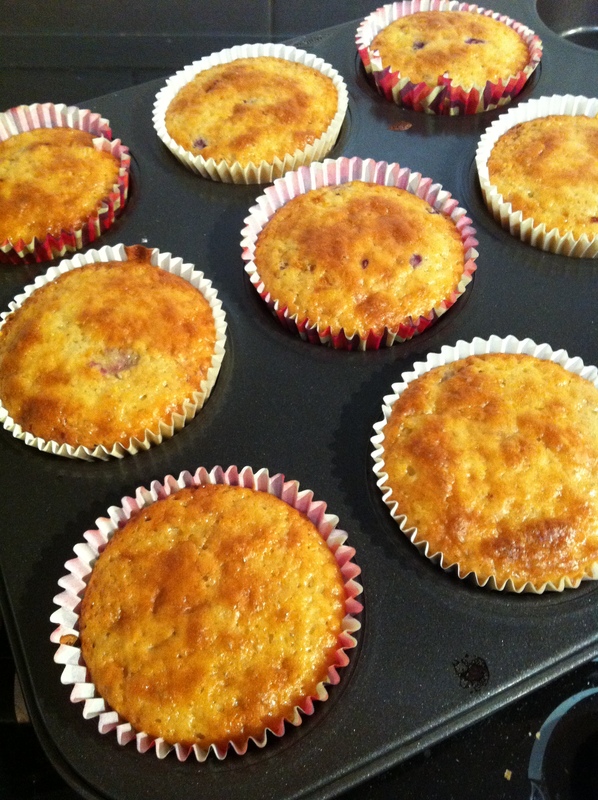 Oh, and these seemed to rise a little more than the lemon-raspberry muffins – I followed the plain flour and baking powder route this time (yes I’ve bought some!) and … maybe it made a difference! I was pleased with this recipe. Quick, easy, and the results were yummy, even if I didn’t do as Nigella says and eat them “broken with fingers and smeared, mouthful by mouthful, with good unsalted butter and blueberry jam”. 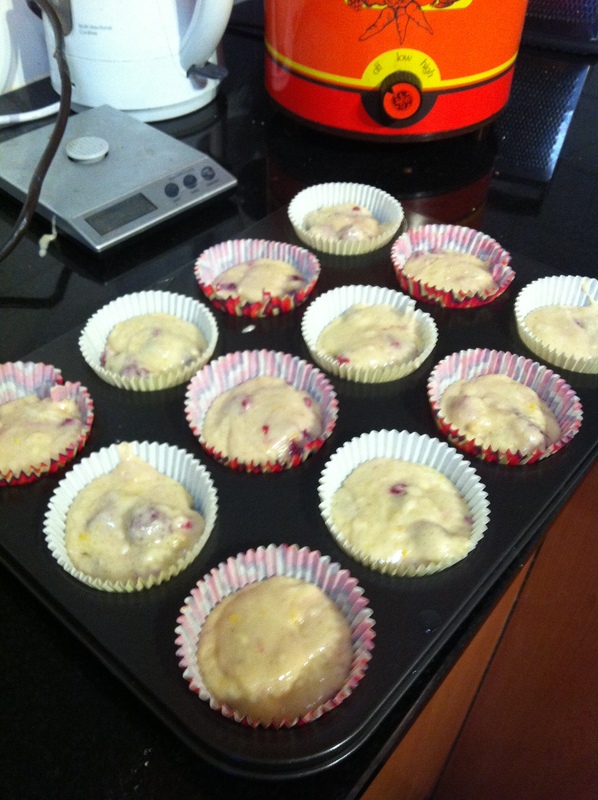 Tags: baking, blueberry, lemon, muffins, nigella, raspberry, yoghurt. Bookmark the permalink.